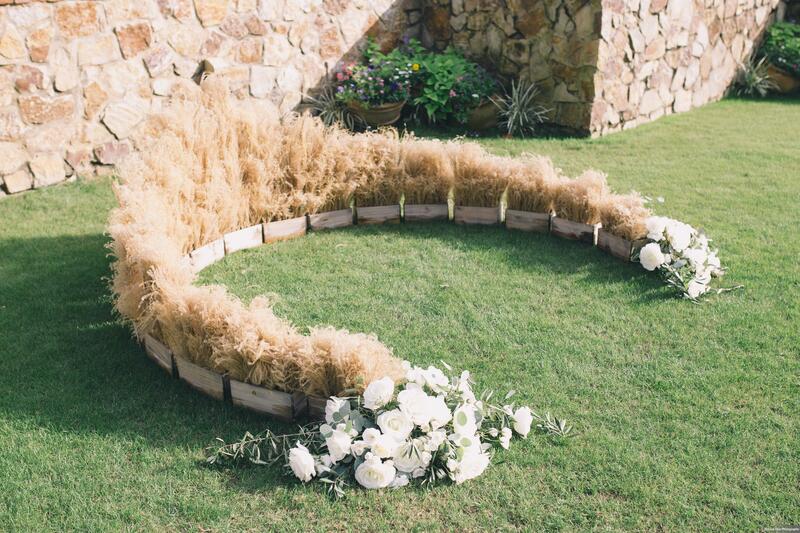 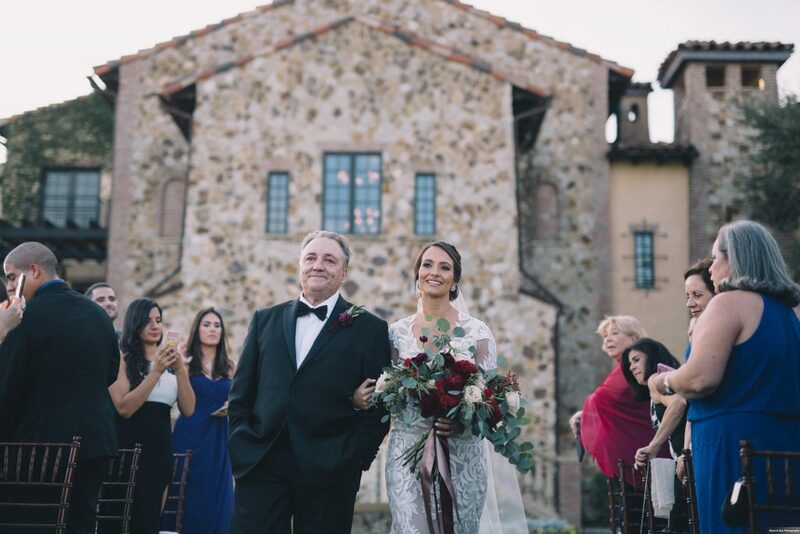 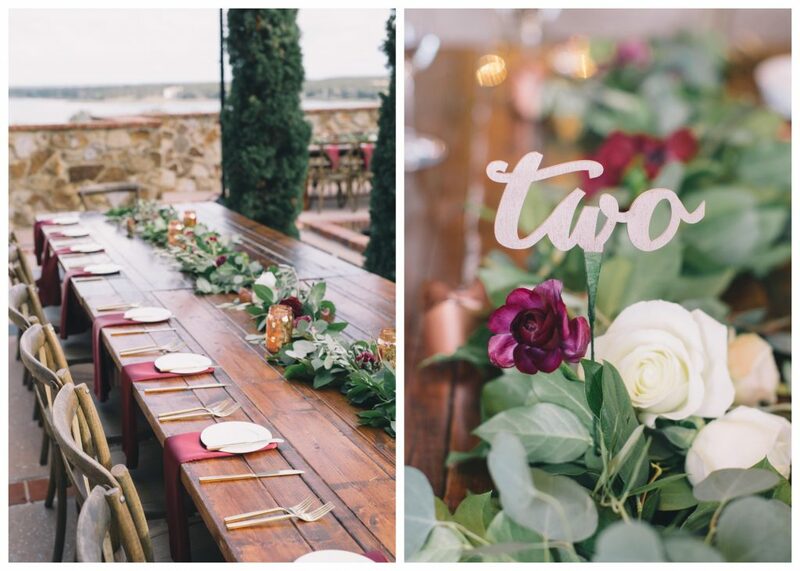 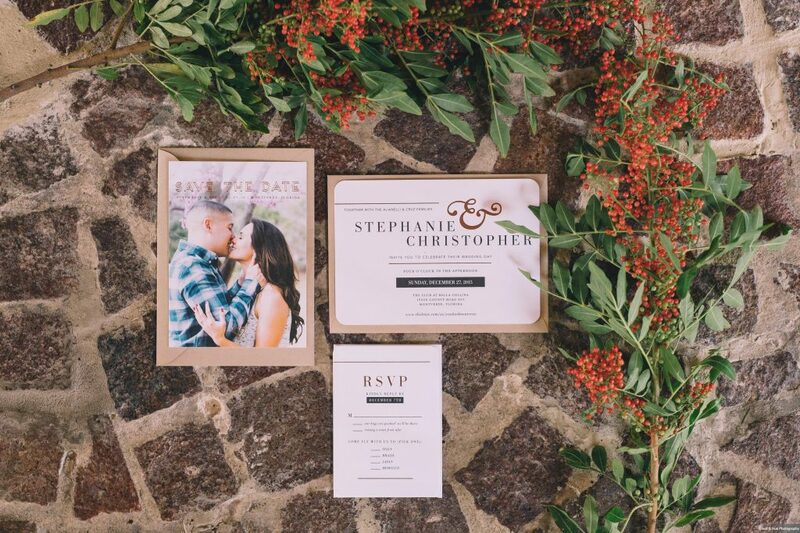 In December of 2015, we met with Stephanie and Christopher (“Kiko”) for a gorgeous, travel-inspired boho chic wedding at the venue Bella Collina. 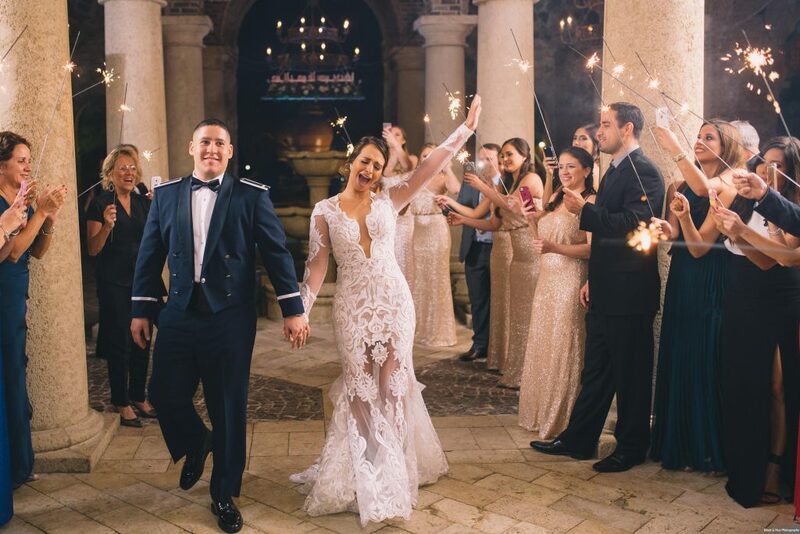 It was a uniquely fun experience working with Stephanie as she was also a wedding planner in South Florida! 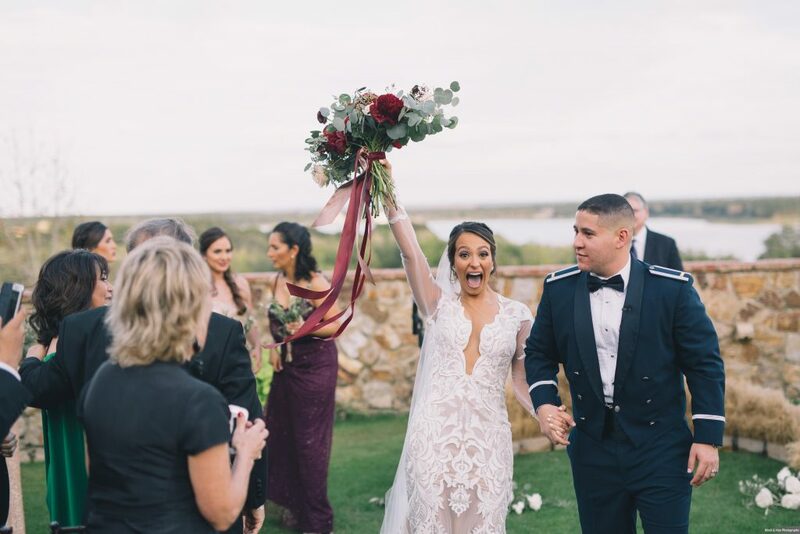 Together we were able to craft a beautiful and personal wedding that exemplified the happy couple’s love and sense of style. 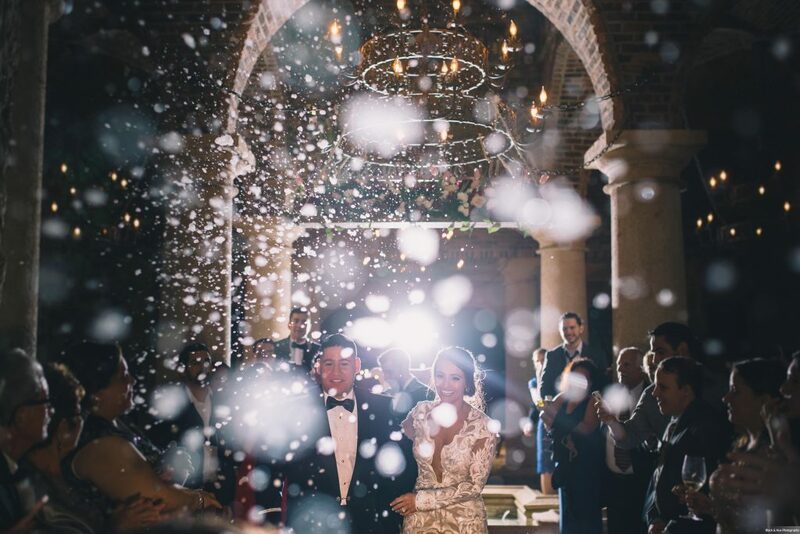 In fact, their wedding stood out so much that it was featured in blogs for PopSugar and WeddingWire. 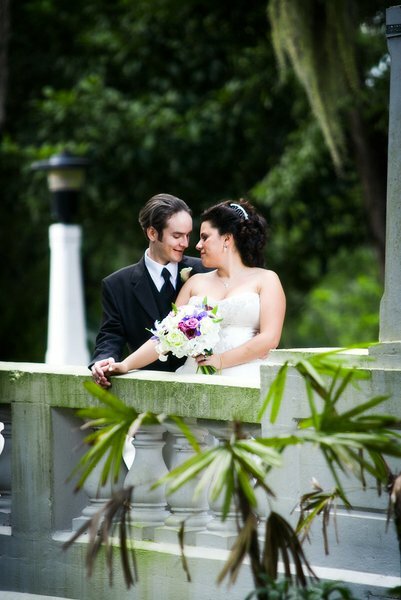 All pictures are courtesy of the fabulous Black & Hue Photography. 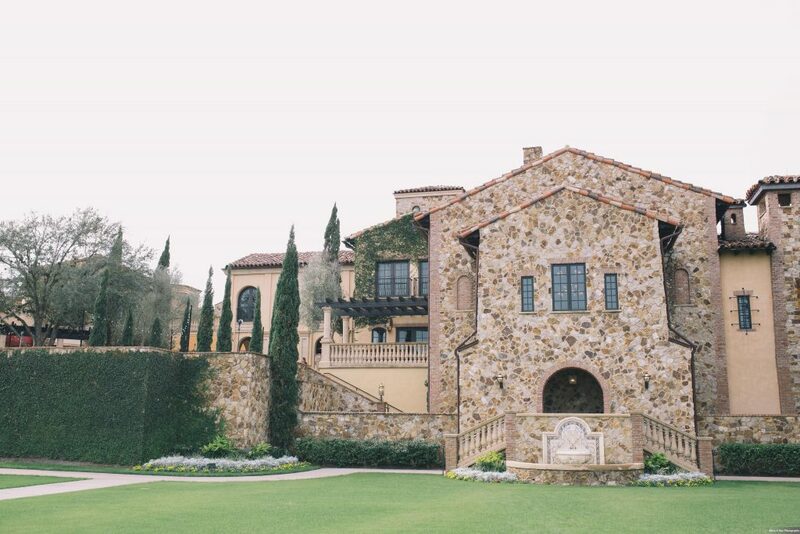 The day took place at Bella Collina, one of the most gorgeous wedding venues in Florida. With its stone brick walls, it looks almost like a small Medieval castle, the perfect place for a royal wedding such as this. 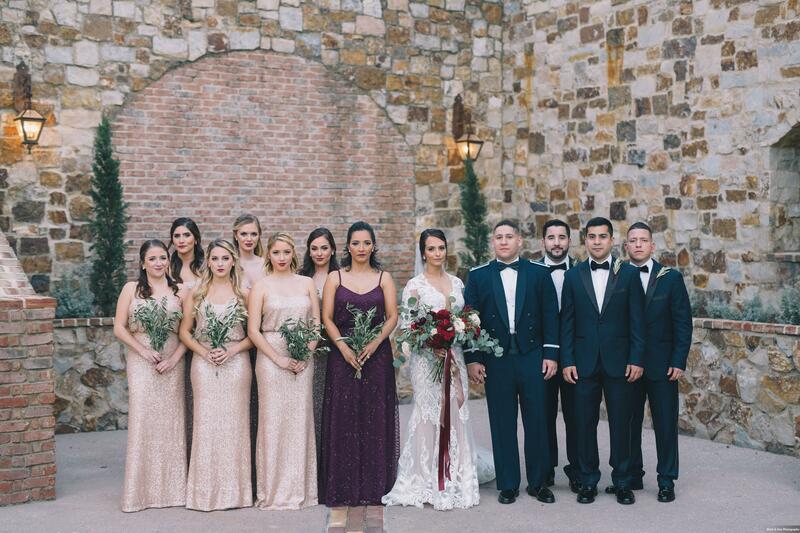 The bridesmaids got ready in matching red pajamas that read “I love you”. 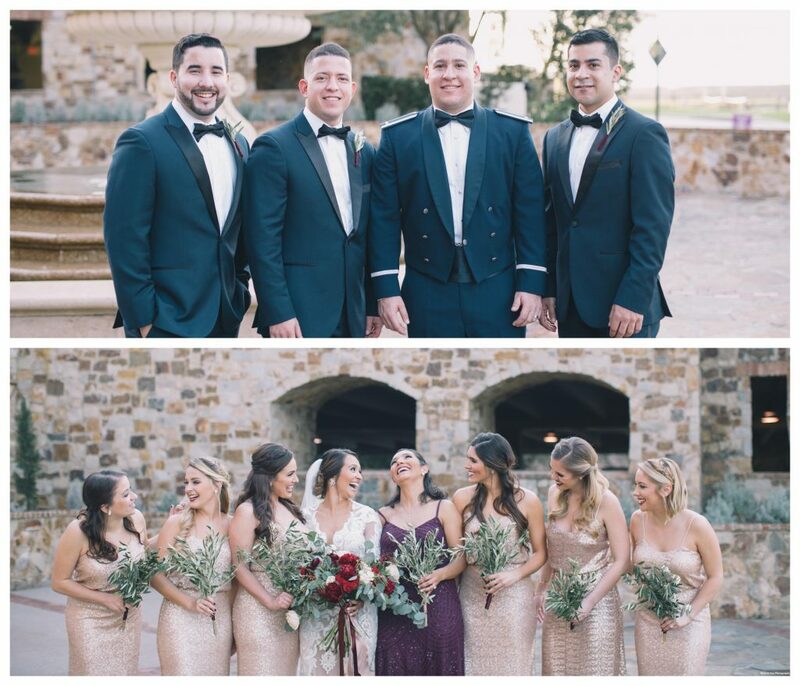 The men wore navy suits, and the women wore rose gold gowns, save for the maid of honor in deep purple and of course the bride in lacy white. 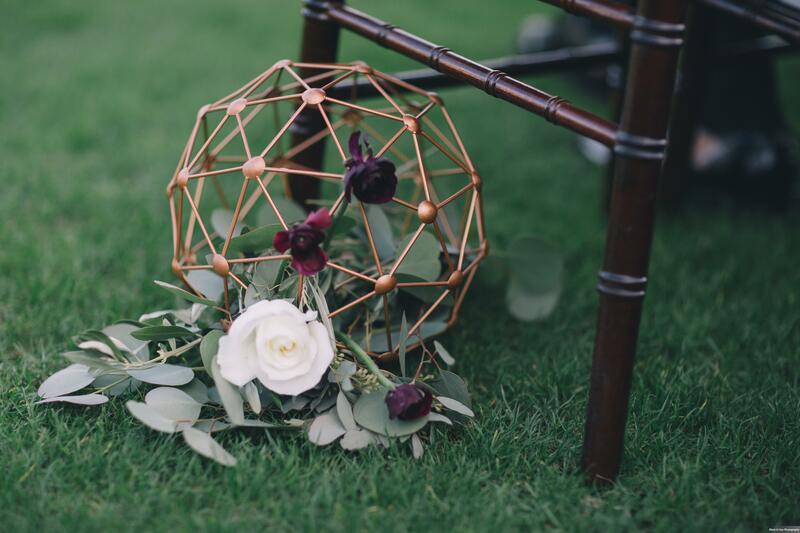 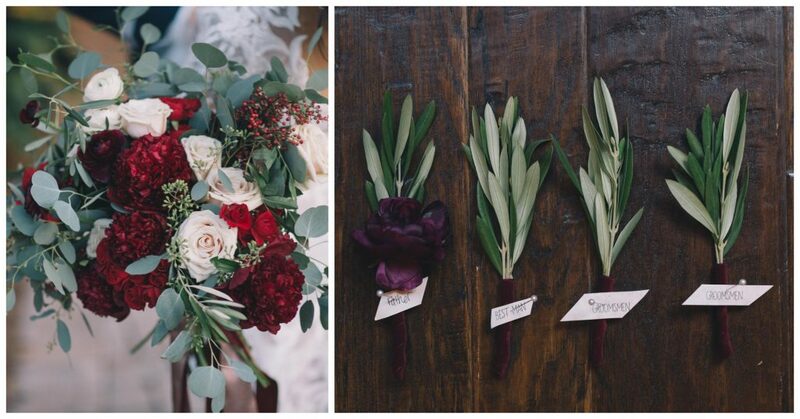 The simplistic bouquets and boutonnieres were designed by Bluegrass Chic. 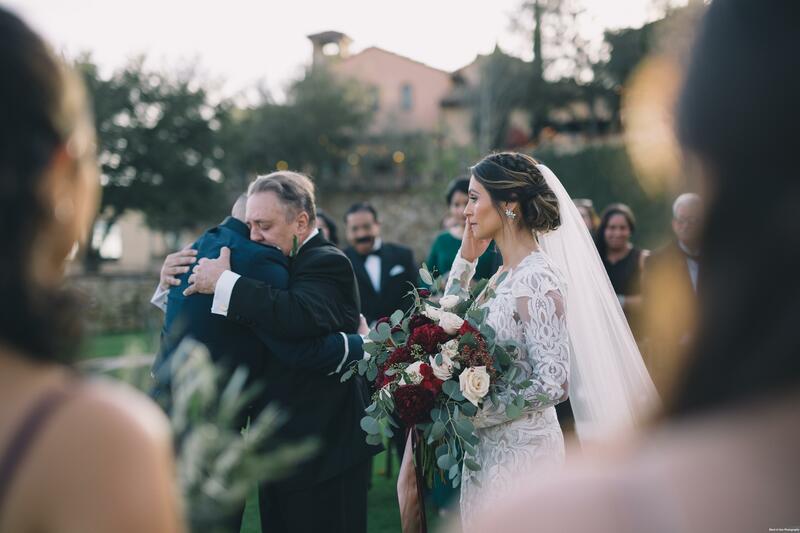 The ceremony was beautiful; held outside on a gorgeous December day, Stephanie was walked down the aisle by her father, who ended the walk in a hug from Kiko. There wasn’t a dry eye as the two exchanged their vows, and once they were pronounced man and wife, they walked joyfully back down the aisle, Stephanie’s face in a huge smile! 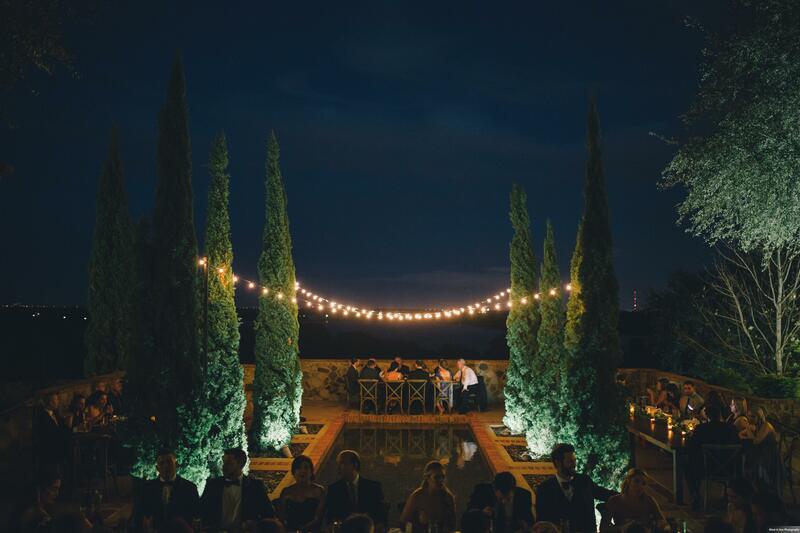 Our next destination was the reception, also outdoors at the Refection Pool at Bella Collina. 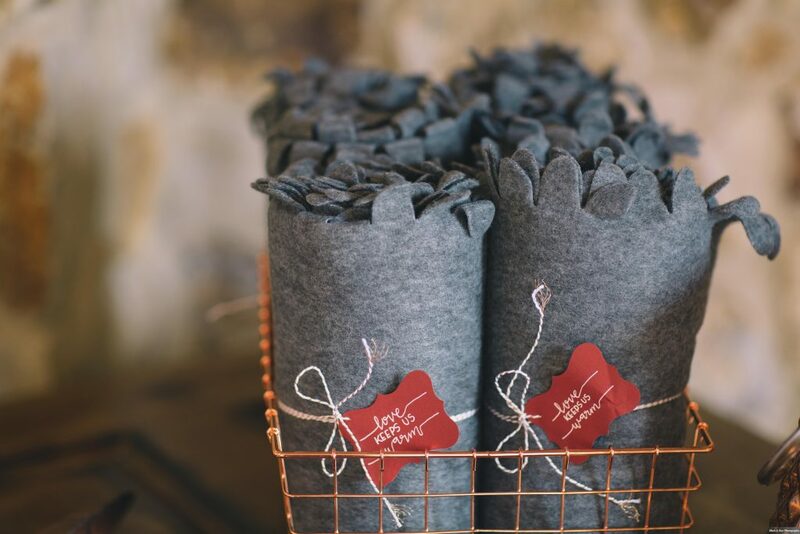 The bride and groom provided a basket full of blankets for guests who got cold in the December air, each featuring a small tag that said “Love Keeps us Warm”. 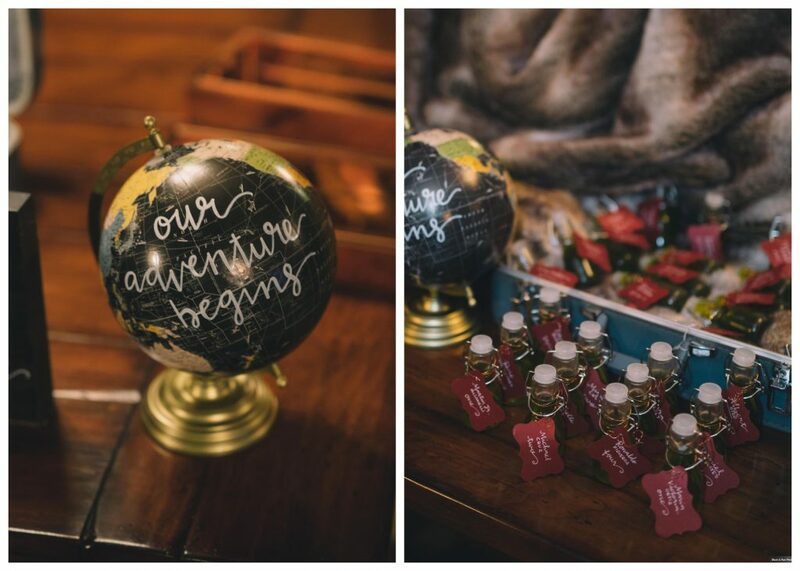 They had a very cool and fun way to pass out favors and table assignments in one – with the invitation, Stephanie and Kiko had their guests vote for which honeymoon destination they should choose. 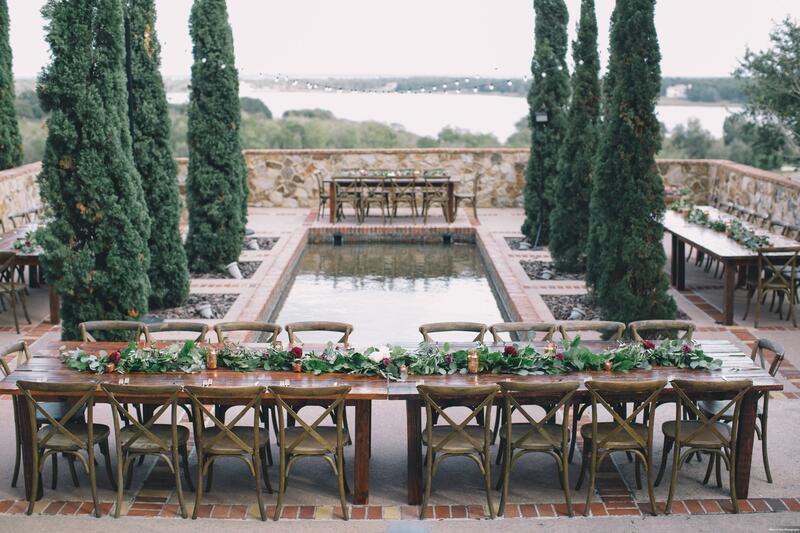 Based on that vote, they determined the favor which would go along with that guest’s table assignment. For example, if they voted for Japan, their seating assignment was attached to a pair of chopsticks; if they voted for Italy, their seating assignment was attached to a small bottle of olive oil. 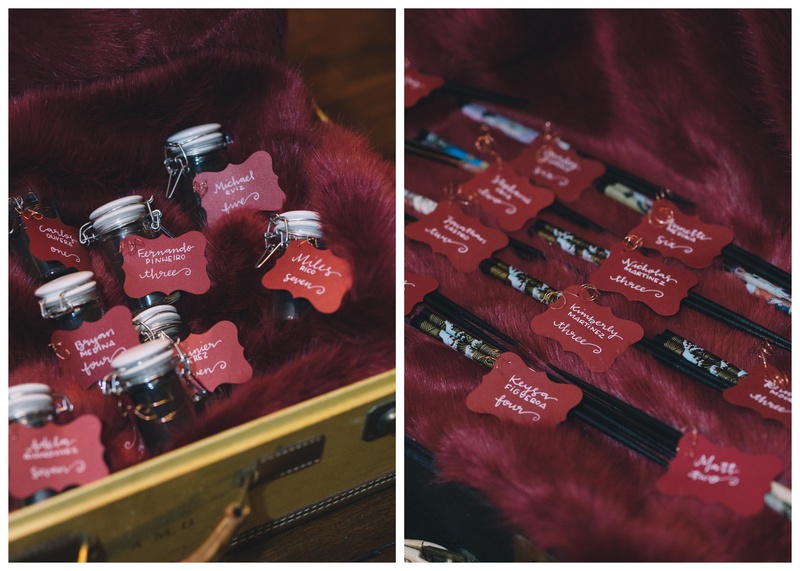 It was a very cute and very personal way to provide both favors and table assignments in one! 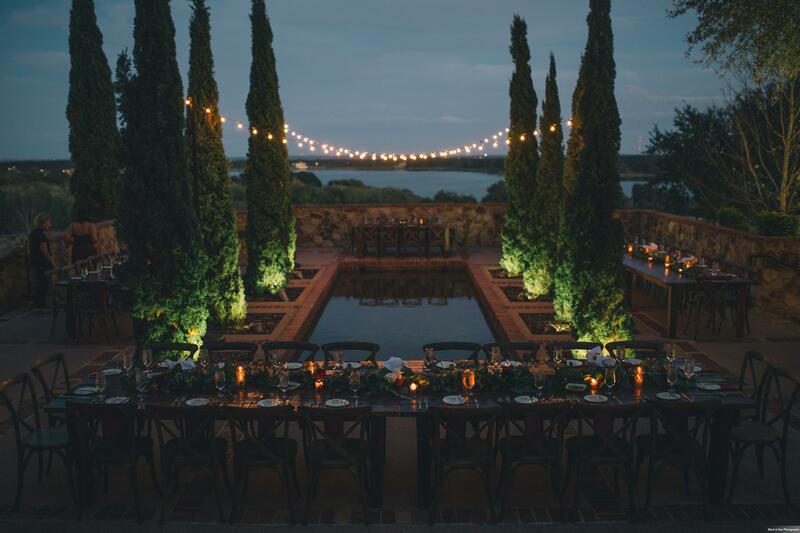 The reception space was lit with gorgeous market lighting, the rustic wooden tables provided by A Chair Affair draped with greenery and florals. 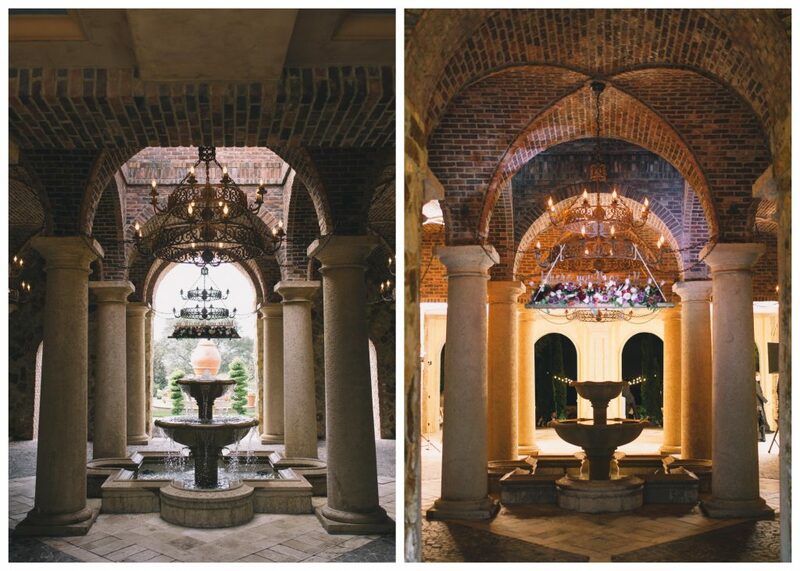 The space of Bella Collina was decked out in florals as well, with lots of work done to highlight the chandelier hanging above the fountain in the entryway to the space. 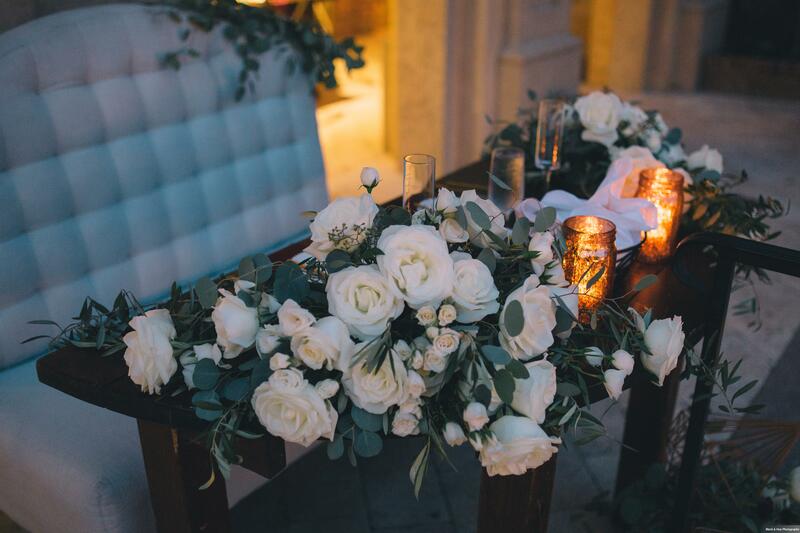 The sweetheart table for the bride and groom featured the most flowers, mainly white roses, and two simple candles in mason jars. 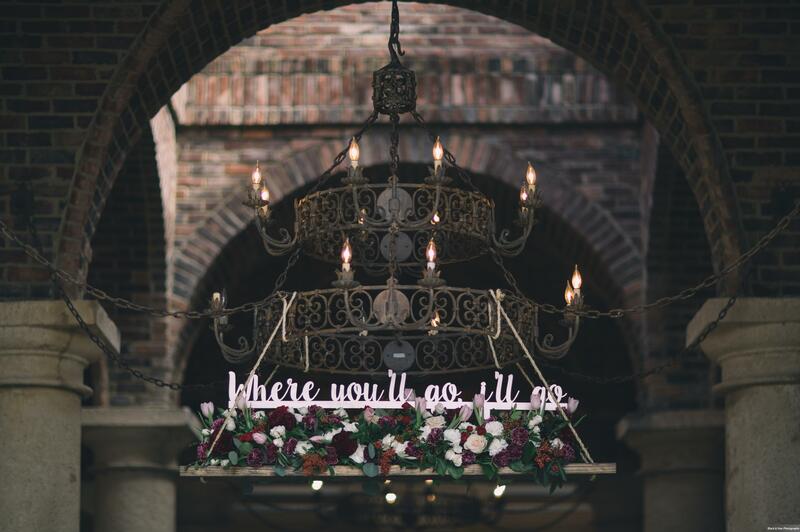 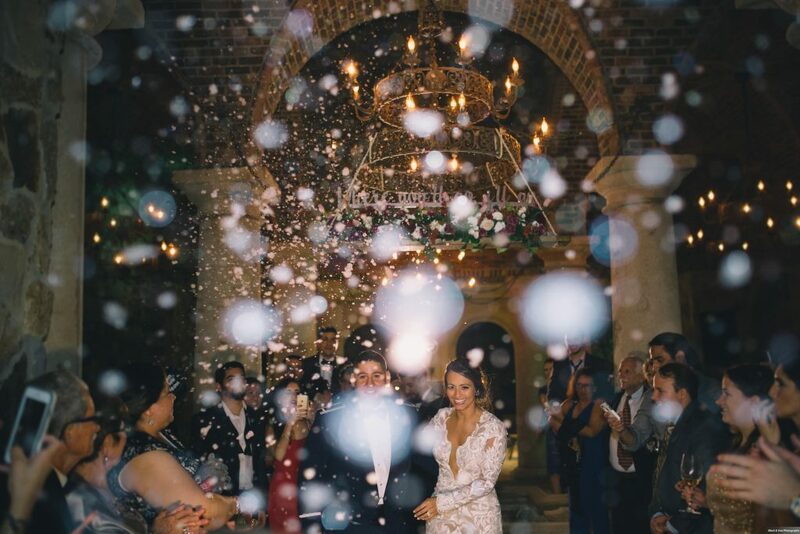 We loved this fun switch-up – instead of using sparklers for their grand exit, the bride & groom were revealed into the reception courtyard under the glow of sparklers. 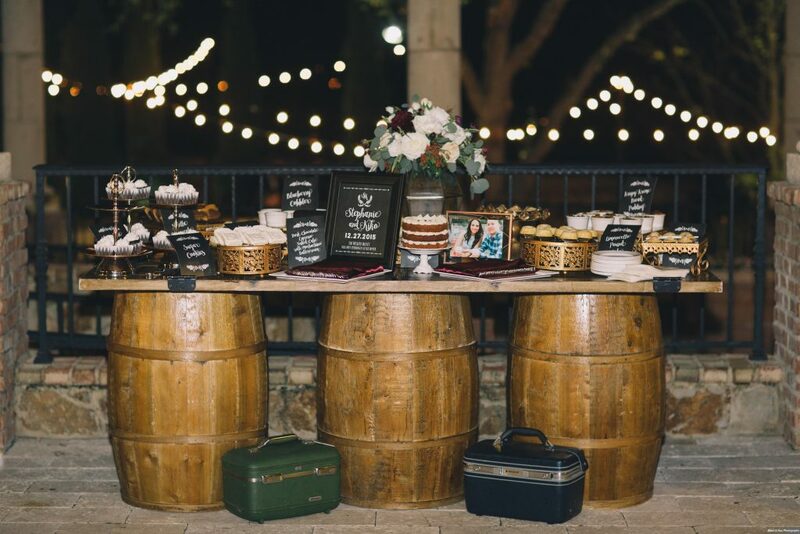 In addition to dinner, dancing, and merriment, there was a great surprise for the guests: an entire dessert buffet, provided by Two Sweets Bake Shop. 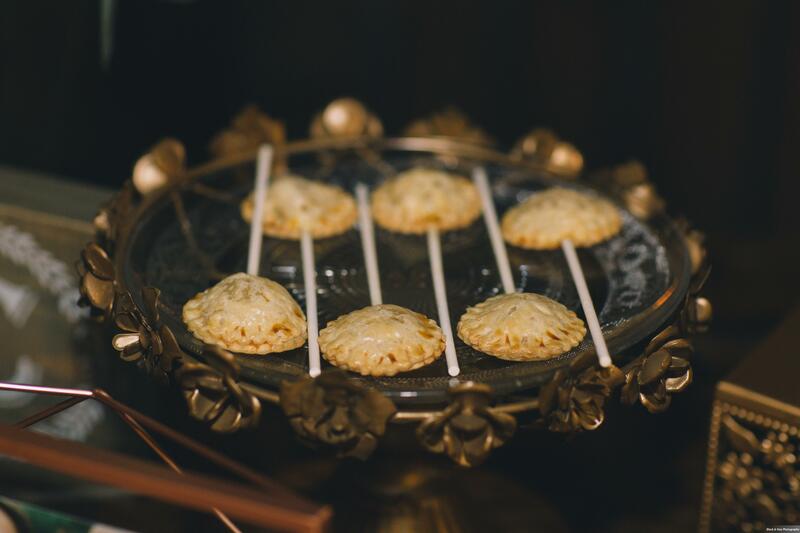 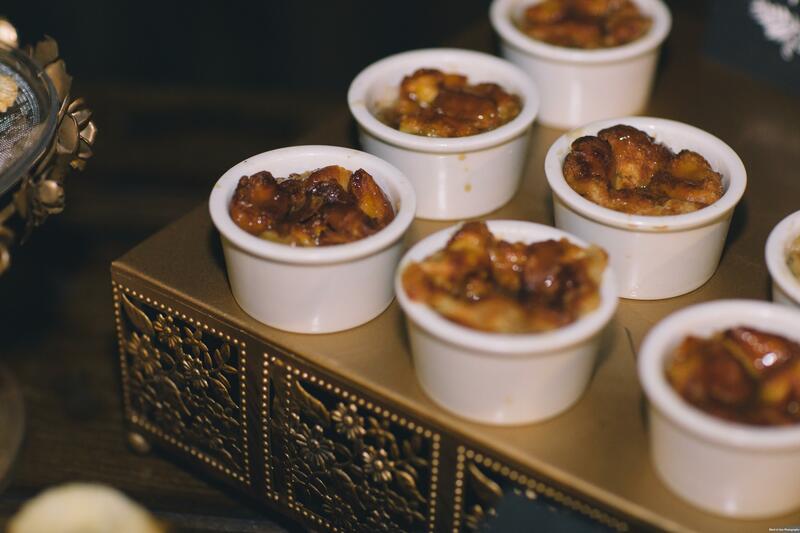 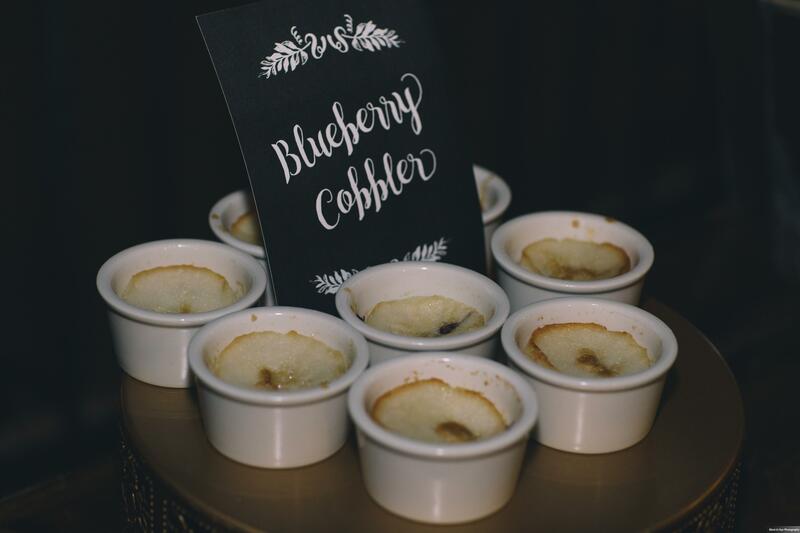 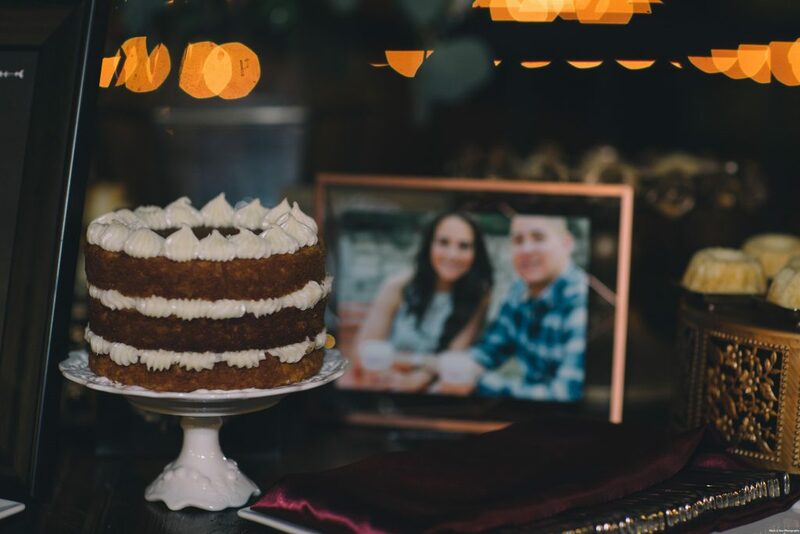 From pie pops to sugar cookies to blueberry cobbler to the minimalist wedding cake, the variety of desserts they provided were delightfully unique. 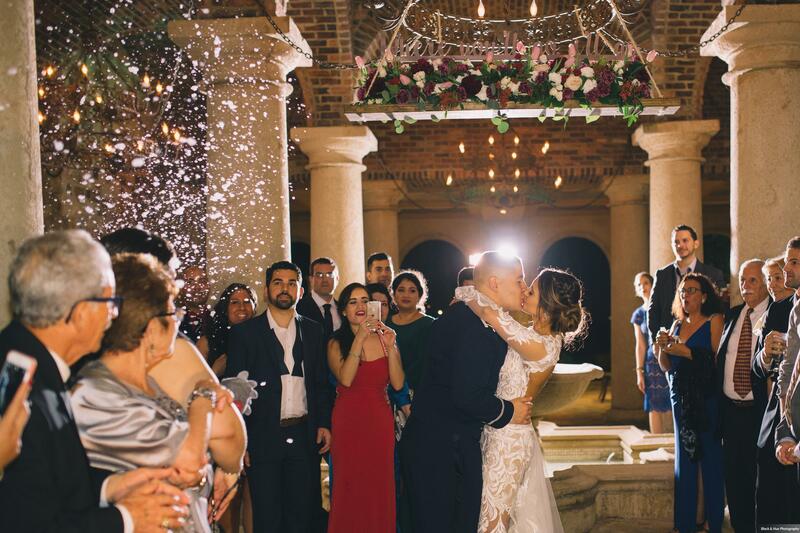 Stephanie and Kiko’s grand exit was even grander than their entrance – they left in a flurry of bubble snow, a perfect ending to a December wedding in Florida. 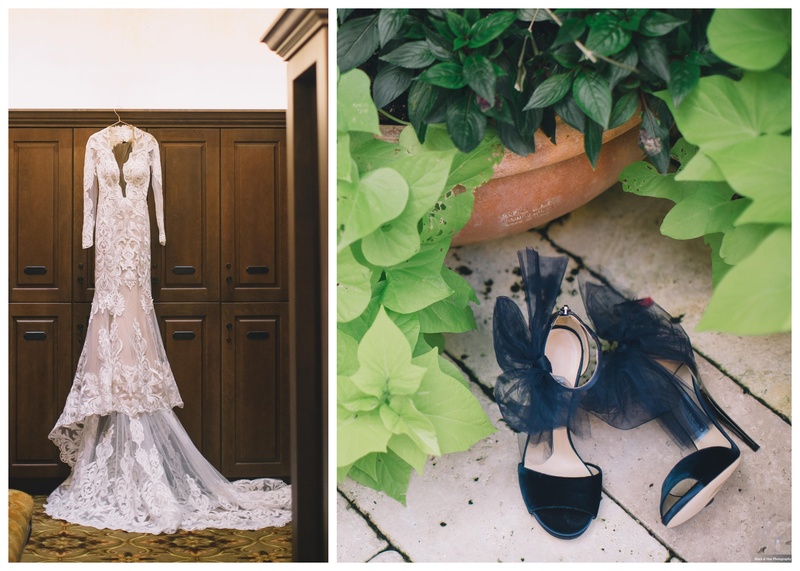 We were delighted to spend the day with Stephanie and Kiko, and are very thankful to them, the venue, and all the vendors that made this beautiful wedding possible!